The National Assessment of Educational Progress (NAEP) is a test that monitors how student achievement changes over time and across states. NAEP has been administered in states since 1990, though not all 50 states began to consistently take NAEP until 2003. 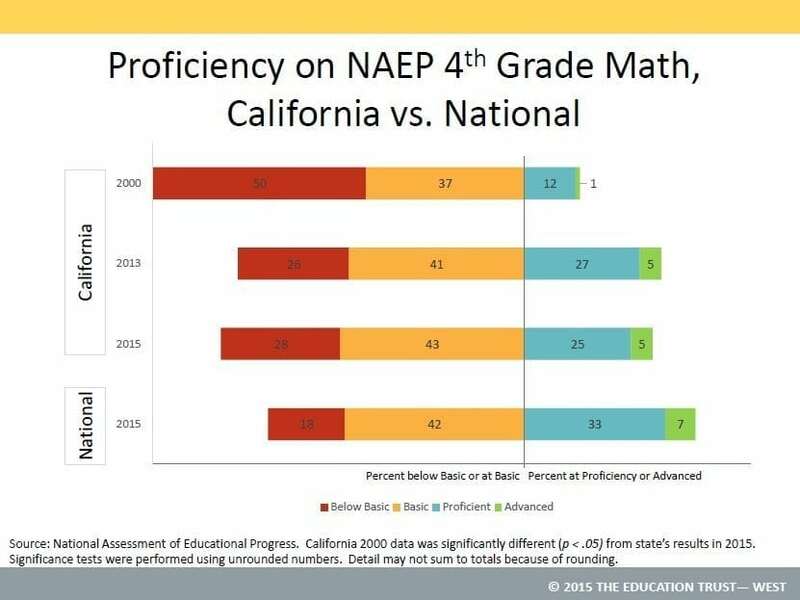 Newly released results for California show that across all subjects, the percentage of students meeting or exceeding proficiency has increased from 2000 to 2015. And since 2003, California has been the fastest-improving state for students overall in 8th grade reading. However, the results also reveal that we are struggling to close achievement gaps for certain groups of students. While Black-White and Latino-White gaps have narrowed over time, they are not closing fast enough. And while California has made some progress in narrowing the income gap, a sizable gap still remains. Additionally, the gap between English learners and non-English learners has consistently widened across reading and math in 4th and 8th grades. Below is a presentation from Ed Trust – West that analyzes the new data and examines how these results compare to the national results and how these results look over time.